Craig Scott hit all three Phantoms goals. Peterborough Phantoms chose the perfect time to deliver the complete performance last night (January 20). The city team had tried and failed to beat fierce rivals Milton Keynes on SIX previous occasions this season. 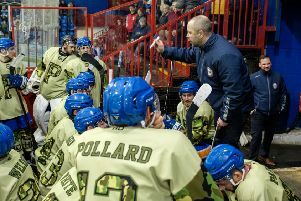 But it all came right on the most important night as they swept into the final of the EPL Cup with a 3-0 success at Planet Ice to clinch a 6-3 aggregate verdict. Phantoms were outstanding from back to front - from a 31-shot shut-out for netminder Janis Auzins to a fine hat-trick for forward Craig Scott – and at all points in between to clinch a fine result. Coach Slava Koulikov said: “We haven’t had the best of results lately, but the guys were all magnificent from start to finish. “To beat our big rivals with a shut-out to reach a cup final ranks as our best performance of the season. “We did say beforehand that it wouldn’t mean our season was over if we lost, but everyone was determined to make it through to the final and that showed in the way we played. Phantoms didn’t have to wait long for a breakthrough as Scott buried a fine Milan Baranyk pass at 3:18 to edge them ahead on the night and on aggregate after a 3-3 deadlock in the opening leg in Buckinghamshire the previous week. But there were no further additions to the scoreline until Scott sealed Phantoms’ progress with two goals in little more than five minutes during the final period – not bad for a player who had failed to light the lamp in his last 10 ganmes. Scott pounced on an error from Lightning netminder Dean Skinns to double the advantage before reacting in an instant to complete his treble after Ales Padelek had steered the puck into his path. Phantoms were only millimetres away from applying further gloss after the visitors had pulled Skinns late on. Padelek fired against a post before Darius Pliskauskas put the rebound wide of the gaping net. But they were already assured of their place in the final by then. Koulikov added: “We saw Milan and Darius end their runs without a goal against Manchester last Saturday and it was great to see Craig do the same thing against MK. Koulikov declined to comment publicly on a series of incidents in the final minute which soured a match which had otherwise been a terrific spectacle. Lightning import Frantisek Bakrlik, who has a history of petulance when things are not going his way, something the many Phantoms fans in attendance for the club’s famous play-off final triumph on Easter Sunday will recall, sparked a melee by boarding Will Weldon, who reacted angrily. It was refreshing to see Phantoms stand up for themselves so strongly. Robbie Ferrara traded blows with another Lightning irritant, Bobby Chamberlain. Then, when play resumed, Greg Pick was sent on with instructions of making MK pay for their actions. It didn’t take him long as he gave Jack Watkins a good hiding before quickly departing to a standing ovation with a match penalty. Sometimes such sacrifices are necessary and satisfying in this uncompromising sport. Tensions also threatened to boil over on the benches as Koulikov and Lightning coach Pete Russell engaged in plenty of verbals and gesturing to earn misconduct penalties. It was a pretty unnecessary end to a memorable night for Phantoms, but it probably just made their post-game beers taste sweeter. Koulikov’s men are now two hours of hockey away from a trophy. They face a final against either Guildford or Basingstoke with the former winning 1-0 in the first leg of that semi last night.